Union and Ohio political leaders want to create a task force to identify and overcome any disadvantages of Wrangler production staying in Toledo. The UAW and political leaders are gathering Monday in a community-wide effort to keep Jeep Wrangler production in its original home of Toledo, Ohio, U.S. Sen. Sherrod Brown’s office said Friday. Brown, Rep. Marcy Kaptur and Mayor D. Michael Collins will join a group of workers, local leaders and community members at UAW Local 12 to launch the effort to keep the Wrangler at the Chrysler Assembly Plant. Fiat Chrysler Automobiles CEO Sergio Marchionne earlier this month said the next Wrangler may have be built off a unibody platform, feature smaller engines and switch to an aluminum body. Those changes could mean the Wrangler would have to find a production site outside Toledo, Marchionne said. After this announcement, Brown and Kaptur wrote to Marchionne, asking him to keep Wrangler production and jobs in Toledo. Marchionne met with Mayor Collins last week. After their meeting, FCA said, “Fiat Chrysler Automobiles valued the opportunity to continue the dialogue with representatives from the City of Toledo and the State of Ohio today relative to production at the Toledo Assembly Complex. 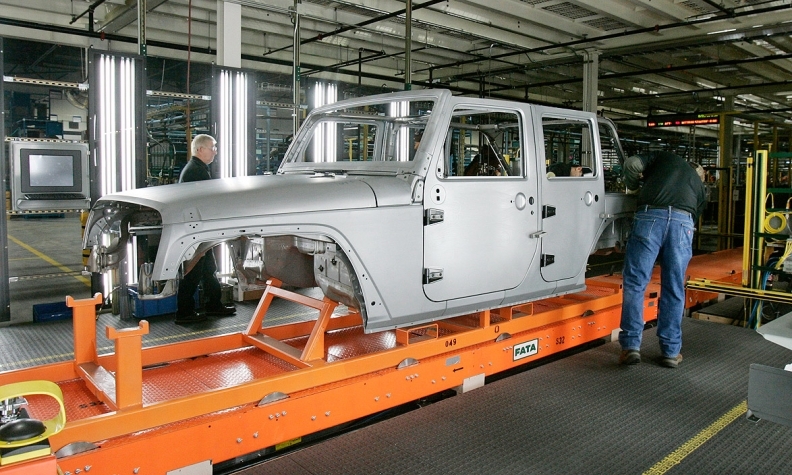 Jeep Wrangler production relies on 1,700 workers at the Chrysler Assembly plant and 800 employees at suppliers within 5 miles of the factory, the statement said. The plant, which has been manufacturing Jeeps since the 1940s, has more than 6,000 employees and has been recognized as the most efficient assembly plant in North America twice, the statement said. At the Detroit auto show just 10 months ago, Marchionne said FCA will always build Wranglers in Toledo. Through September, Wrangler’s U.S. sales this year have risen 12 percent to 134,068 vehicles. Jeep’s total U.S. sales have skyrocketed 45 percent this year to 516,387 vehicles.